This indicator visualizes the intersection of two moving averages. (SМА, EMA, SMMA, LWMA). It has been created for visibility of signals and notification about intersections of Moving Average. 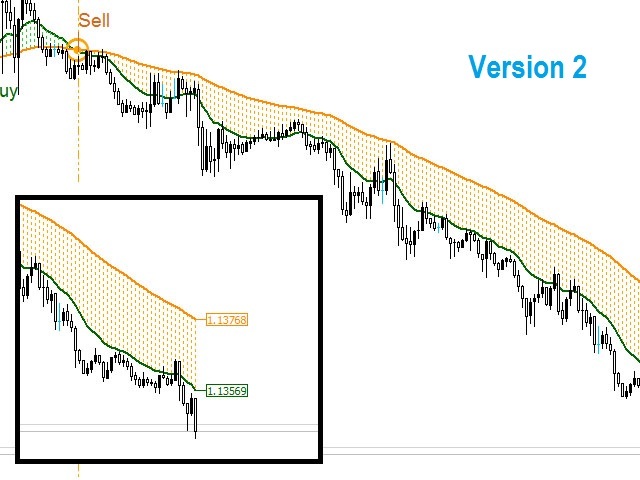 Moving Average is simply the averaged value of the price for the selected timeframe (TF). 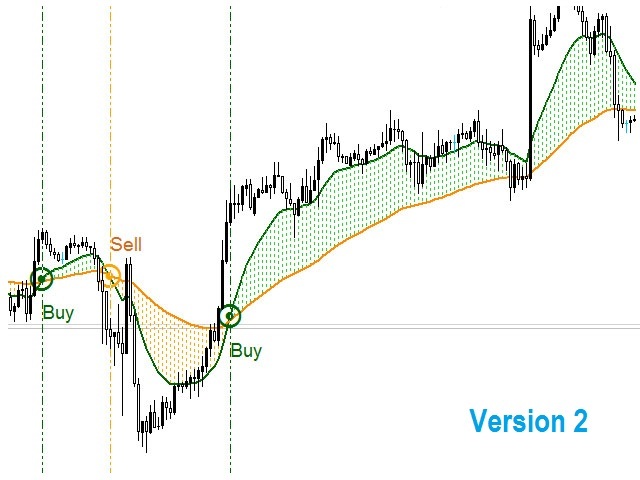 Therefore, the moving averages are used on a wide variety of timeframes, from 1 minute to a year and even decades. The indicator has the ability to change colors and periods of Moving Average. 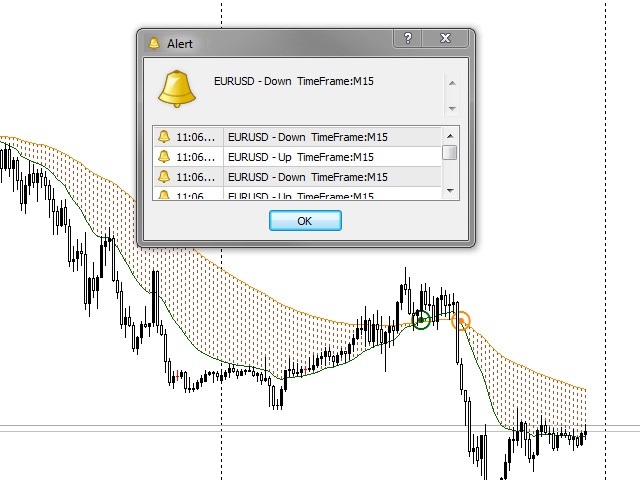 With the correct understanding, the indicator visually shows the direction of the trend for the currency instrument. 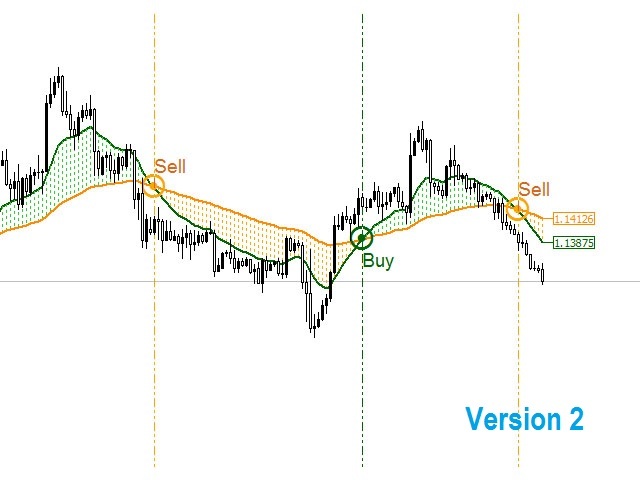 Intersection of Moving Averages of different periods and types is the simplest and most common strategy from the variety of Forex trading methods. For example, if an MA with a smaller period (fast) crosses an MA with a long period (slow), then a signal appears, indicating an entry in the trend direction. At an inverse intersection, the trend may change, generating a signal to exit the current deals and to enter in the other direction. Draws a graphical icon at the intersection point. 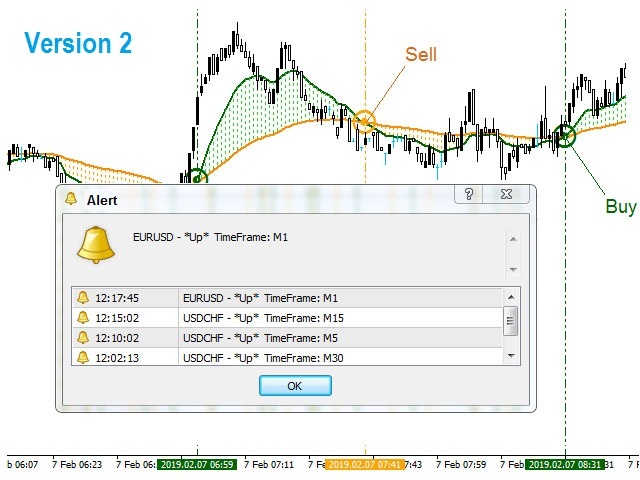 Opens an alert box, containing the time of the intersection, name of the currency instrument, timeframe (TF) and the name of the entry signal ("Down" or "Up"). PeriodMA_1 - period of the first (fast) Moving Average, default: 19. MA_metod_1 - Moving Average calculation type, default: EMA. Appied_price_1 - type of the price used in calculation of MA, default: Close price. PeriodMA_2 - period of the second (slow) Moving Average, default: 79. MA_metod_2 - Moving Average calculation type, default: EMA. Appied_price_2 - type of the price used in calculation of MA, default: Close price. Width - icon width, default: 3. Num_cross - the number of notifications in the history of the alert box, default: 5. ShowHistogram - fill the space between Moving Averages, default: true. 0 - fill color (histogram) for the "Down" signal, default: Sienna. 1 - Moving Average (fast) color, default: DarkGreen. 2 - fill color (histogram) for the "Up" signal, default: DarkGreen. 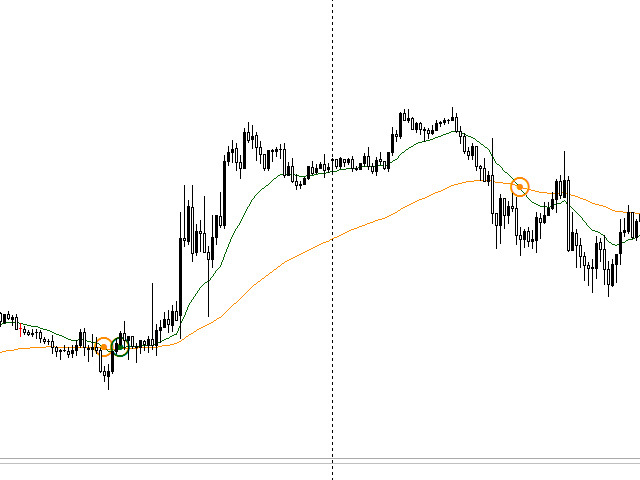 3 - Moving Average (slow) color, default: DarkOrange. 4 - icon color for the "Down" signals, default: DarkOrange. 5 - icon color for the "Up" signals, default: Lime. Note: the line filling style (histogram) and the style of Moving Averages can also be adjusted. Do not open deals in the other direction until an intersection occurs. A movement that started is likely to return. Remember that Moving Averages are also dynamic levels of support and resistance. - Отредактирован текст алерта (оповещения о пересечении МА). с временной меткой на шкале времени графика. - Добавлены ценовые метки на формирующемся МА. - Добавлены текстовые сноски (Buy и Sell) около пересечения МА. отступы, цвета и размеры текстов , значков и меток полностью настраиваемые.